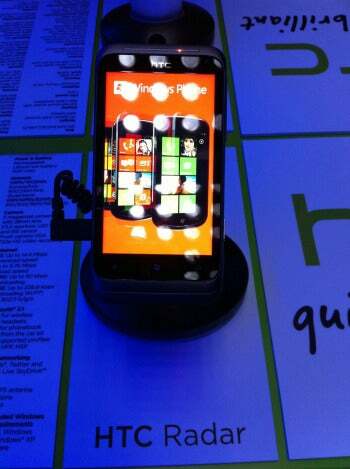 HTC launched two smartphones Thursday that run Microsoft's latest update of its mobile operating system, called Mango. Microsoft is struggling to gain market share from Apple and Android smartphones. HTC said the two devices, the Radar and the higher-specification Titan, will be available next month, first in Europe and Asia. At a launch event in London, HTC officials did not say which carriers will sell the devices or list pricing. HTC is the second company to launch devices running Windows Mango, known as Windows Phone 7.5, after Fujitsu Toshiba Mobile Communications announced in July the IS12T, which will only be available in Japan. Microsoft faces an uphill battle in the rapidly changing smartphone market, highlighted by Google's acquisition last month of Motorola Mobility for $12.5 billion. Microsoft held just 2.7 percent of the smartphone OS market for the first quarter of this year, according to analyst firm IDC, losing ground from a year before despite a complete rework of its mobile operating system. HTC's launch comes ahead of Windows Mango phones expected to be launched by Microsoft's partner Nokia, which said in February that it would transition from using the Symbian operating system to Windows Phone 7. But Nokia isn't expected to begin shipping large volumes of Windows 7 phones until next year. Other Microsoft partners include Taiwan's Acer, China's ZTE, Dell and Samsung. The devices from HTC both have molded aluminum bodies, similar to HTC's Desire and Sensation smartphones. The Titan is the higher-spec model of the two. It has a 1.5GHz processor and 16GB of embedded memory with 512MB of RAM. Its display is a 4.7-inch "super LCD" touchscreen with 480x800 WGVA resolution. The Radar has a 1GHz processor with 8GB of internal memory and 512MB of RAM. 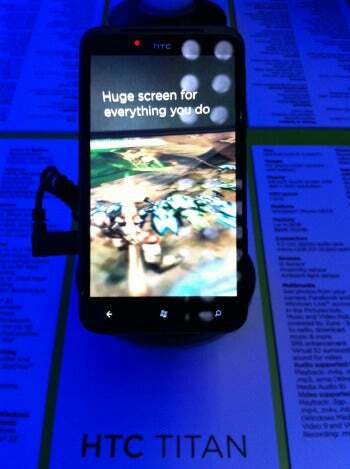 It also has a super LCD screen of the same resolution but measuring 3.8 inches. Both phones support HSDPA (high-speed downlink packet access) for downloading, with speeds up to 14.4 Mbps. Upload speeds are up to 5.76 Mbps. The Titan shoots photos at 8 megapixels, while the Radar's camera is 5 megapixels. Both cameras have a 28-millimeter wide-angle lens and shoot high-definition video. Microsoft's Mango update adds 500 new features to the operating system, including a mobile version of its Internet Explorer 9 browser and support for HTML5, the latest rewrite of the Web's mother coding language. The company has also focused on tighter integration with its cloud services: Mango will let users share documents created in Microsoft's Office productivity suite with Office 365--which includes online hosted versions of those applications -- and Windows Live SkyDrive, an online storage platform. Mango also supports multitasking, which allows the tiles representing applications to download new information that is shown immediately on the screen, such as weather or stock data. HTC has included some of its own applications on the Titan and Radar, such as HTC Watch, which allows users to watch film trailers and rent or download films to their device. One of the main draws for a smartphone platform is applications. Last month, Microsoft released a detailed overview of the submission process for Mango-compatible applications as it hopes to attract developers. Microsoft's Windows Phone Marketplace has 30,000 or so applications, but that figure pales in comparison to Apple's App Store, which has more than 400,000, and Google's Android Market, with more than 250,000.